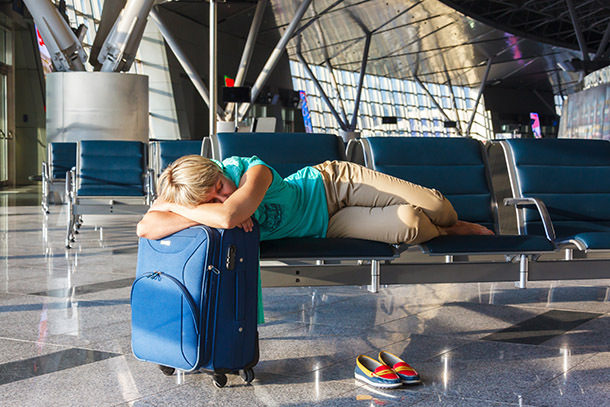 Cramped seats, dry air, cabins that go from hot to cold in a matter of minutes—we’re all acquainted with the discomforts of flying. We asked 10 frequent-flying pros for their best tips on how the 99 percent (upgrading to first class doesn’t count) can keep as comfortable as possible. Yes, we all know we should drink enough water, but will you regret that one glass of wine? Read on to find out what the experts say. Water, that is. This is one tip nearly all of our experts were quick to mention. "Hydrate, hydrate, hydrate," says Jerry Bishop, a commercial pilot who's flown mostly trans-Atlantic routes for the past 18 years. "It's really just common sense, but you don't realize how much flying takes out of you." San Diego-based travel writer Cynthia Dial says she tries to drink a quart of water for every four hours she's in the air. 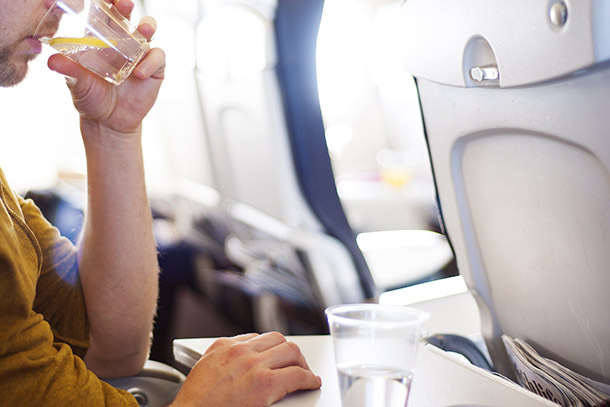 Bobby Laurie, a former flight attendant whose nationally syndicated travel talk show The Jet Set debuts next year, says he always travels with his own water bottle, whether purchased in the airport or a refillable one from home (most airports have filtered water fountains), to hold him over until beverage service. What's in That Little Pill? "A lot of people want to sleep, so they'll take a sleeping pill," says Winnie Partridge, a long-haul flight attendant for 43 years, first for Pan Am, now with United. "But then their flight is delayed, and they're out of it by the time it's time to board." Or they can barely rouse themselves when it's time to de-plane. Patricia Schultz, author of the best-selling 1,000 Places to See Before You Die, says if you want to take a sleeping aid, you should experiment with it ahead of time; a friend of hers took an Ambien only to have a reaction that kept her wide-awake for 10 hours. "I use something as simple as two NyQuil—it does the trick for me," Schultz says. Here's where the pros part ways … sort of. 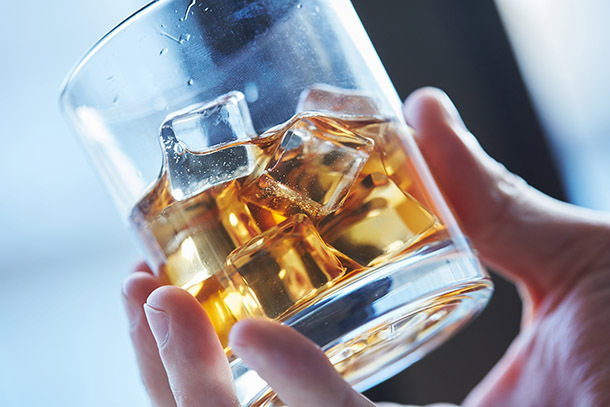 Both Bishop and Partridge recommend that passengers avoid alcohol altogether if they want to leave the plane feeling rested and refreshed. But common sense is the key. "Personally, I like a glass of wine to help me to sleep," says Craig Cocchi, a Silicon Valley executive whose work takes him frequently to Asia. And Dial says she'll occasionally have wine with her onboard meal, but limits it to one glass. One thing everyone agrees on: Overindulging is a no-no. Since being named a Forbes Top 20 "Social Media Power Influencer" two years in a row, attorney Glen Gilmore has become a sought-after international speaker and thus frequent international traveler. But when you stand 6'5", an aisle seat is a must, especially on long haul flights—but not every aisle seat offers the same value. 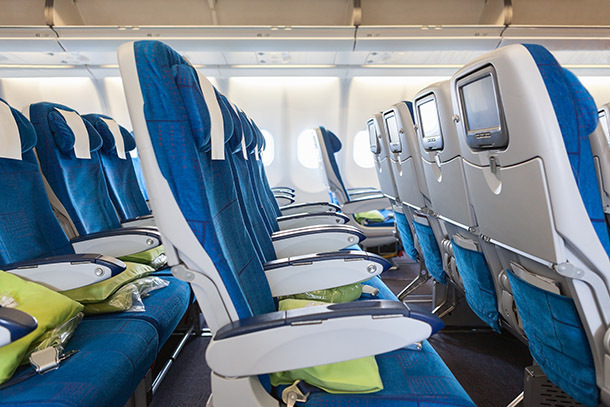 One of the most unanimous tips our pros offered was using SeatGuru to get a map and description of the seats on your flight, so you won't get stuck at the back of the plane with no room to recline, or next to the heavy-traffic bathroom area. When Stephen Marino—an East Coast-based VP of sales who has logged more than 2 million miles (for lifetime platinum status)—travels with his girlfriend, he books a window and an aisle seat. 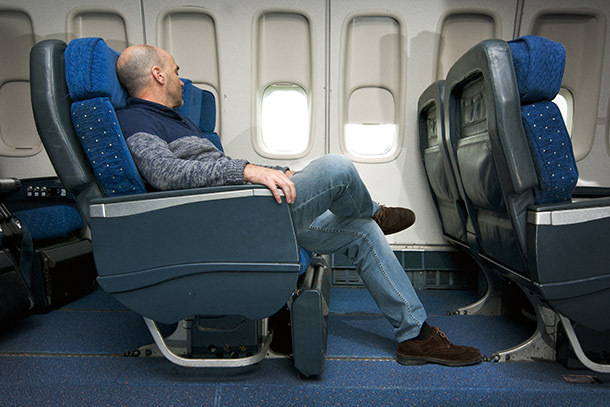 "With higher level status, airlines try to keep the seat next to you open. If not, we ask the person in the middle seat if they want a window. They will never turn it down." If your ticket was booked as a sale fare, says former flight attendant Laurie, you might not be able to find a seat to reserve online. But sometimes the airlines will release "premium/for-purchase" window and aisle seats 24 hours before departure. And if you still don't have an assignment just before boarding, the gate agents may upgrade you to an unsold premium economy seat because they're the only available seats left. "Food is always something to consider in advance," says Schultz. "I try to keep it healthy, which means it can't always be a last-minute purchase at the airport. I bring almonds, fruit, protein bars, and raisins from home." Dial says she tries to keep meals light, avoiding foods that are rich or protein-heavy. Cruikshank says she and her husband carry bags of unsalted nuts. 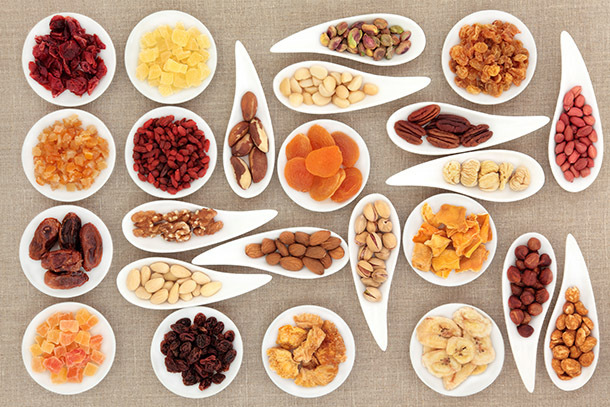 The protein in the nuts staves off hunger and if they're unsalted, they're not as likely to make you thirsty. She also carries sugarless chewing gum because it brings saliva to the mouth and reduces that chronic airplane feeling of thirst. "As much as I want to dress nicely and look glamorous when traveling, my focus is being comfortable on the plane," says Vancouver-based travel writer Arnette Arn. "I never wear jeans or anything constricting. I usually will wear leggings or even fashionable sweatpants and dress them up with a nice top or sweater." Shultz's number one must-have item is a lightweight pashmina shawl to use when the air conditioner spikes, or to roll up and use as a pillow. Like most savvy travelers, Cocchi dresses in layers—like a T-shirt under a warmer shirt or jacket. 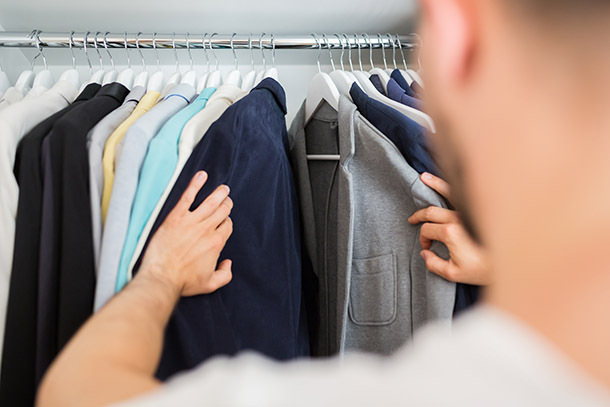 Carol Cruikshank of Palo Alto, California, who has traveled worldwide with her husband for decades, says she usually wears three layers of tops: a shell or tank under a long-sleeve tee, and a jacket or sweater so she'll be comfortable for a range of temperatures. "I stick to dark colors because, well, I've been known to spill my food down my front." "My shoes come off once I'm settled into my seat, so I always pack wooly or thick socks and wear easy-to-slip-on shoes or boots for the flight," says Arn. Another item to consider are compression socks, which not only keep toes warm but can help feet and legs from swelling on long flights, and can also help thwart deep-vein thrombosis (blood clots). Dial shares a tip for diminutive passengers such as herself: She travels with a lightweight, collapsible footstool that she can put under the seat in front of her that lets her stretch out and elevate her legs. "I'm not much for sleeping on planes unless I'm lucky and flying where I can fully recline, so I like to keep to myself—and keep busy," says Gilmore. First he likes to get some work done on his laptop or legal pad, then relax by watching movies that he's downloaded at home. "That way, even the long flights don't see that long." Cruikshank is fond of crossword puzzles when she can't concentrate on reading, because they're easy to put down and pick up again. And though it might not be the lightest option, Schutlz likes to bring "a year's worth of magazines—from People to all the glossy travel mags—and generally a guidebook about the destination I'll be visiting." She also brings her own earbuds for watching movies, because they're better quality than what planes typically provide. 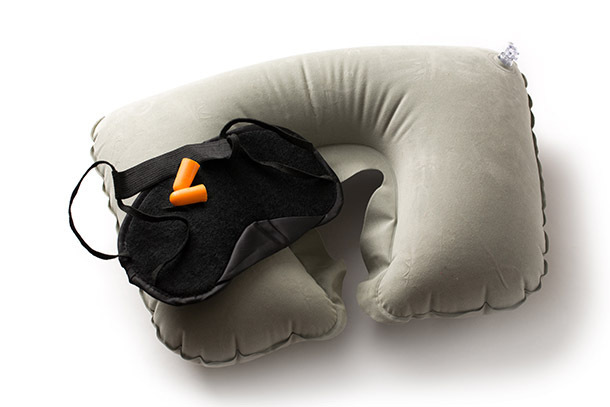 When it's time to get some shut-eye, our experts agree that two of the best things you can carry are some earplugs and an eye mask. Marino favors a pair of high-end, noise-cancelling headphones, "so you can tune people that want to talk to you out." The good ones also help drown out cabin and engine noise. And an eye-mask will keep your neighbor's reading light from keeping you awake. We suggest a pair that has eyecups, rather than a flat mask, because they're both more comfortable and for mascara-wearers, they prevent makeup from smearing. Deb Hopewell is a longtime journalist and the former editor of Yahoo Travel. She writes for Outside, Fodor's, Architectural Digest, Travel+Leisure, Yahoo Travel, and others. Follow her on Instagram @debhopewell and Twitter @dhopewell.